by Library Music, Karleinz Stockhausen, Sun Ra and Space Disco. New MFU 5 track e.p. 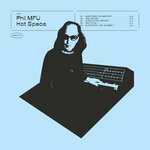 HOT SPACE out now from December 7 on Freaksville Records.